San Antonio Spurs coach Gregg Popovich said Monday that white people "have to be made to feel uncomfortable" because they "were born white" and that gives them white privilege. 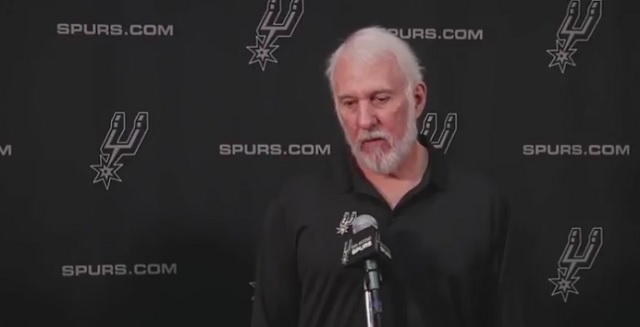 "Obviously, race is the elephant in the room and we all understand that," Popovich said. "Unless it is talked about constantly, it's not going to get better. 'Oh, they're talking about that again. They pulled the race card again. Why do we have to talk about that?' Well, because it's uncomfortable, and there has to be an uncomfortable element in the discourse for anything to change. Whether it's the LGBT movement, women's suffrage, race, it doesn't matter. People have to be made to feel uncomfortable, and especially white people because we're comfortable. We still have no clue of what being born white means." "If you read some of the recent literature, you'll realize there really is no such thing as whiteness, but we kind of made that up. That's not my original thought, but it's true," he said. "Because you were born white, you have advantages that are systemically, culturally, psychologically there," Popovich said. "And they have been built up and cemented for hundreds of years. But many people can't look at it. It's too difficult." "It can't be something that is on their plate on a daily basis. People want to hold their position, people want the status quo, people don't want to give that up. And until it's given up, it's not going to be fixed," he said. To recap, there's "no such thing as whiteness" but "white people" need to check their privilege and give up all their power in order to bring about a multicultural utopia (such as happened in South Africa).